Sparkle is a 70.1250" TTT daughter of 71" TTT, Donovan Eot 468, and out of a daughter of the great Boomerang CP. 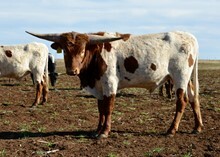 Proven genetics on top and bottom for horn, color, and conformation. She has a good udder and has all around mothering abilities. Calves every year. Her offspring will be Millennium Futurity eligible. Bull calf born 12/07/2018 sired by 79.6250" TTT and 100"+ TH, TS Lone Star 22/5, bringing in Concealed Weapon over JP Rio Grande.